Gangaikonda cholapuram was made the capital of the Cholas by Rajendra I, Raja Raja Chola's son. The entire city with its forts, palaces, halls, tanks, parks, etc. was laid to commemorate his victorious march to the North, to bring the waters of the Ganges. The crowning feature was the Brihadeeswara temple on the model of the Peria koil in Tanjavur. Only a portion of the great temple remains now. The stones from portions were taken to build the Lower Anaicut across the Kollidam. The vimana is smaller than at the peria koil, with few storeys but excels in the bold sculptural details. The distinctive features are the beautiful stone sculptures on the niches, the Simhakeni - a circular well with a lion adorning the entrance, the bull found on a pedestal inside the court, facing the main sanctum. Some of the stone sculptures on the niches - Nataraja, Dakshinamurthy, Harahari, Lingodbhava, Vishnu, Brahma, Mahishasuramardhini, Gnana Saraswathi, Chandesanugrahamurthi. The last sculpture depicts Chandesar being crowned by Siva and Parvathi. 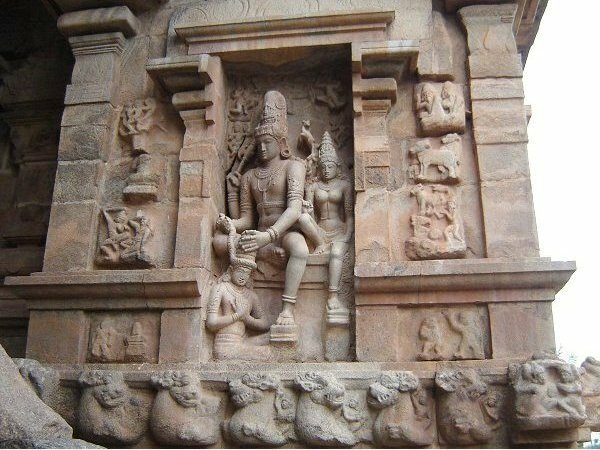 It is said that King Rajendra did not want his own sculpture anywhere in the temple. The clever sculptor created this sculpture, as if the king was himself being crowned by Siva.